The Geena Davis Inclusion Quotient (GD-IQ) is a ground breaking software tool developed by the Geena Davis Institute on Gender in Media at Mount Saint Mary’s University to analyze audio and video media content. Funded by Google.org and incorporating Google’s machine learning technology, and the University of Southern California’s audio-visual processing technologies, GD-IQ is the only software tool in existence with the ability to measure screen and speaking time through the use of automation. This revolutionary tool was co-developed by the Institute and led by Dr. Shrikanth (Shri) Narayanan and his team of researchers at the University of Southern California’s Signal Analysis and Interpretation Laboratory (SAIL), with additional analysis from Dr. Caroline Heldman. Previous studies find that female characters are vastly underrepresented in film, and this has not changed much in the last half a century. In this report, we use the GD-IQ to not only analyze gender representation but also analyze screen time and speaking time in the top 100 grossing films of 2014 and 2015. In addition, we have analyzed results by box office revenue. To date, most research investigations of media representations have been done manually. The GD-IQ revolutionizes this approach by using automated analysis of media content with a precision that is not possible with the human eye or ear. It makes it possible for researchers to quickly analyze massive amounts of data, which allows findings to be reported in real time. We analyzed a total of 200 films for this report: the top grossing (non-animated) films of 2014 and 2015, as reported by Variety. Findings for 2015 are presented here, and findings for 2014 are included in Appendix C. We use the GD-IQ, a revolutionary new automatic audio-visual tool – the first of its kind developed specifically to analyze media content. Existing research on gender, race, and other representations in media almost exclusively employ content analysis performed manually by research assistants who view media content and score it “by hand.” The approach limits the number of films or other media content that can be analyzed due to time constraints. It is also subject to human error and lacks precision because it relies on a human capacity to record character and scene details. Automated analysis of media content gets around the limitations of human coding. Beyond the significant advantage of being able to efficiently analyze more films in less time, the GD-IQ can also calculate content detail with a level of accuracy that eludes human coders. For this report, we measure on-screen time by partitioning the movie into face-tracks by tracking the detected faces locally in time. Gender is computed for each face-track separately. We then calculate total screen time by gender for each film using the track duration. We measure speaking time by applying an automatic speech detection program that classifies the speaker as female or male. For further information about this automated processing tool, please refer to Appendix A. In addition to the automated data, we include a general overview of gender in each film using hand coded data. For more information on the hand coding process, please refer to Appendix B. In 2015, 17% of the top grossing films had a female lead. Women had a particularly strong presence in the comedy and action genres. Amy Schumer, Melissa McCarthy, Tina Fey, Amy Poehler, and Anna Kendrick had hit movies, demonstrating that funny women are bankable in Hollywood. For this analysis, we compare films with male leads, female leads, and male-female co-leads. The co-lead category includes ensemble casts where both men and women are featured roughly equally. Films with multiple male leads or multiple female leads were folded into the male lead and female lead categories, respectively. The GD-IQ shows that male characters dominated both the screen time and speaking time in the top grossing films of 2015. How to interact with the data: Each of the bars represent a single film. If you roll over (or touch on a mobile device) the bars or pie charts, the percentages for female and male characters will appear. You can also select the year and other variables to refine the results. In films with male and female co-leads, male characters receive significantly more screen time (24.8%) than female characters (16.0%). So even when men and women are both featured as leads in a film, male characters are far more prominent than female characters. In 2015, male characters spoke two times as often as female characters in the top box office movies (28.4% compared to 15.4%). The gender gap in speaking time is even larger in films led by men. Male characters spoke three times more often than female characters (33.1% compared to 9.8%) in films with male leads. Gender gaps in screen time and speaking time were even bigger in action films, a film genre that is typically dominated by men. Even though women played leading roles in action blockbusters such as Star Wars: The Force Awakens (Daisy Ridley), The Hunger Games Series: Mockingjay Part 2 (Jennifer Lawrence), and The Divergent Series: Insurgent (Shailene Woodley), overall, male characters appeared and spoke on screen three times more often than female characters in action films. On average, the top 100 grossing non-animated films of 2015 earned $90,660,000 each. Films with female leads made considerably more on average than films with male leads – $89,941,176 for female leads compared to $75,738,095 for male leads. Films led by women grossed 15.8% more on average than films led by men. Films featuring male and female co-leads earned $108,317,073 – 23.5% more on average than films with male or female leads alone. Many factors determine the box office revenue of a given film, but these numbers are revealing. 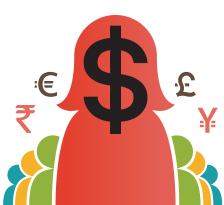 Our findings debunk the idea female leads are not bankable. Films with female leads actually earned more money than films with male leads, and casts with both male and female leads perform even better. Gender balance in casting produces sound financial returns. The revolutionary technology powering GD-IQ gives the tool the ability to uncover unconscious gender bias with a depth that has not been possible to date. The GD-IQ was designed to push the boundaries of how we identify the imbalance of the representation of specific demographics and stereotypes in media. Content creators from the worlds of film, television, advertising, publishing, digital and more will be able to identify and recognize the issues contributing to the problem and correct the course. The GD-IQ’s capabilities go well beyond simply analyzing gender bias. The Institute, in partnership with Google and USC Viterbi School of Engineering, will present the research findings from this investigation along with additional automated methods to analyze individual-level character attributes, such as representations of animated characters and the composition of background scenes, at our Global Symposiums on Gender in Media in Los Angeles and in New York. This first report concludes that women are underrepresented in film, and when they do appear, they are seen and heard far less than their male counterparts. In films with a male lead, male characters appearing on screen nearly three times more often than female characters (34.5% compared to 12.9%). 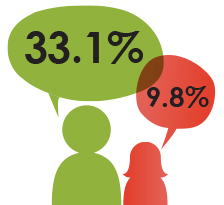 Male characters spoke two times as often as female characters (28.4% compared to 15.4%). 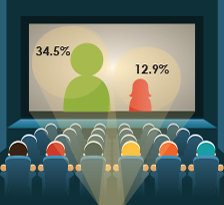 Films led by women grossed 15.8% more on average than films led by men. Algorithms are a set of rules of calculations that are used in problem-solving. For this report, we employed two automated algorithms that measure screen and speaking time of characters by their gender. Here is an overview of the procedures we used for each algorithm. We compute the screen time of female characters by calculating the ratio of female faces to the total number of faces in the film’s visuals. The screen time is calculated using online face detection and tracking with tools provided by Google’s machine learning technology. In the interest of precision and time, we estimate screen time by computing statistics over face-tracks (boxes tracking the general outline of each face) instead of individual faces. The face-tracks returned by technology include different attributes of the face with the corresponding time of occurrence in the video. Among the attributes returned for each of the detected faces, we use two parameters - the confidence of the detected face and the system’s posterior probability for gender prediction. A threshold of 0.25 was empirically chosen for determining confident face detection. An overview of the on-screen time estimation process is shown in Figure 1. Due to multiple characters appearing on screen simultaneously, the face-tracks can be overlapping, as illustrated in Figure 1. A gender label is then assigned to each track using the average gender posterior associated with the confident faces in the track. If the average gender posterior probability of the track is greater than 0.5, the track is classified as a “female track,” otherwise, it is a “male track.” The number of frames with confident face detections in each track is summed up across all tracks to get the total number of faces. The number of female tracks is aggregated to get the total number of faces predicted as female. Finally, the screen time is computed as the ratio between the number of female face detections to the total number of face detections across the length of the movie. Supplementary analysis shows that screen time estimated at frame-level (individual faces) instead of using face-tracks was not significantly different and was comparable. Furthermore, computing the average of gender posterior over tracks has an added benefit of “smoothing out” some of the local gender prediction errors. Face tracking incorporates temporal contiguity information to reduce transient errors in gender prediction that may occur with analyzing individual faces independently. Using movie audio, we compute the speaking time of male and female characters to obtain an objective indicator of gender representation. The algorithm for performing this analysis involves automatic voice activity detection, audio segmentation, and gender classification. Voice Activity Detection: Movie audio typically contains many non-speech regions, including sound effects, background music, and silence. The first step is to eliminate non-speech regions from the audio using voice activity detection (VAD) and retain only speech segments. We used a recurrent neural network based VAD algorithm implemented in the open-source toolkit OpenSMILE to isolate speech segments. Segmentation: We then break speech segments into smaller sections in order to ensure each segment includes speech from only one speaker. This is performed using an algorithm based on Bayes Information Criterion (BIC), available in the KALDI toolkit. Thirteen dimensional Mel Frequency Cepstral Coefficient (MFCC) features are used for the automatic speaker segmentation. This step essentially decomposes continuous speech segments obtained in the VAD step into smaller segments to make sure no segment contains speech from two different speakers. Gender Classification: The speech segment is then classified into two categories based on whether it was likely spoken by a male or a female character. This is accomplished with acoustic feature extraction and feature normalization. Acoustic Feature Extraction: We use 13-dimensional MFCC features for gender classification because they can be reliably extracted from movie audio, unlike pitch or other high-level features where extraction is made unreliable by the diverse and noisy nature of movie audio. Feature Normalization: Feature normalization is deemed necessary to address the issue of variability of speech across different movies and speakers, and to reduce the effect of noise present in the audio channel. Cepstral Mean Normalization (CMN) is a standard technique popular in Automatic Speech Recognition (ASR) and other speech technology applications. Using this method, the cepstral coefficients are linearly transformed to have the same segmental statistics (zero mean). Classification of the speaker as either male or female is based on gender-specific Gaussian mixture models (GMMs) of the acoustic features. These models are trained on a gender-annotated subset of general speech databases used for developing speech technologies using frame-level features for each gender. The GMM we use in this system has 100 mixture components and is optimized by tuning the parameters in a held-out evaluation set. For a new input segment whose gender label is to be predicted, the likelihoods of the segment belonging to a male or female class are computed based on this pre-trained model. The class with higher likelihood is assigned to the segment as the estimated gender prediction. The total speaking time by gender is then computed by adding together the durations for each utterance classified as Male/Female. This gives us the male and female speaking time in a movie. Data on character prominence was produced through hand coding. For this study, leading characters are defined as the major force driving the story. Co-leads are classified as two (or more) characters that share roughly equivalent screen time and are equally involved in driving the story. Some analysts require that characters appear within the first five minutes of a film to be counted as a lead or co-lead, but for our analysis, we evaluate the entire film to determine the prominence of the character. A team of three researchers conducted a content analysis that produced these statistics. Prior to initiating the work, the research team met twice for training sessions and performed multiple statistical tests to ensure that their analysis was in agreement. They calculated inter-coder reliability on 10 films (10% of the sample) that were not in the top 100 grossing of 2015 and 2014 to ensure agreement. Inter-coder reliability was achieved in terms of both absolute agreement and Cohen’s Kappa measures. Male characters received twice as much screen time as female characters in 2014. Male characters were on screen 29.6% of the time compared to 15.9% of the time for female characters. In films with male leads, female characters only appear on screen 12.3% of the time, while male characters appear 32.8% of the time. This means that male characters are almost three times more likely than female characters to appear on screen in films with male leads. In films with female leads, male characters (20.5%) get about the same screen time as female characters (21.6%). Having a female lead does not translate into more screen time for female characters than male characters. Male characters get significantly more screen time in films that have male leads than female characters get in films that have female leads (32.8% compared to 21.6%). When men play the leading role, male characters dominate the screen time, but when women play the leading role there is no screen time advantage for female characters. In films with male and female co-leads, male characters appear on screen more often than female characters (26.9% compared to 20.6%). Adding a woman as a co-lead in a film does not mean female characters get equal screen time with male characters. Male characters are twice as likely to speak as female characters in the top grossing films. Overall, male characters spoke 31.8% of the time in films compared to 14.5% of the time for female characters. In movies with male leads, male characters speak four times as much as female characters (36.7% compared to 8.8%). When men play the lead in a film, male characters have a strong speaking time advantage. In movies with female leads, female characters speak 29.5% of the time compared to 17.7% for male characters. This speaking time advantage for female characters is not as large as the advantage male characters get in films with male leads, and this advantage disappears in films from 2015. In films with male and female co-leads, male characters speak significantly more than female characters (27.8% compared to 19.7%). This means that when men and women lead a cast together, male characters still dominate the dialogue. On average, the top 100 grossing non-animated films of 2014 earned $72, 228,000 each. Films with female leads made considerably more on average than films with male leads or male and female co-leads. Films with female leads earned $108,909,090 compared to $70,500,000 for films with male leads and $66,161,290 for films with male and female co-leads. See the Geena Davis Institute on Gender in Media, 2014. “Gender Bias Without Borders: An Investigation of Female Characters in Popular Films Across 11 Countries.” Stacy L. Smith, Marc Choueiti, & Dr. Katherine Pieper with assistance from Yu-Ting Liu & Christine Song Media, Diversity, & Social Change Initiative USC Annenberg. Our datasets do not include animated films since the automated tool is not yet able to read animated characters. Future reports will include animated films.